In June 2013 the European Parliament issued the EU physical agents Directive 2013/35/EU which aims to introduce reference levels for exposure to electromagnetic fields (EMFs). 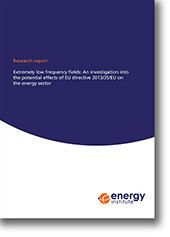 This research report contains the results of a research study conducted to identify any areas within the energy sector which may produce low frequency and extremely low frequency (ELF) EMFs that exceed the limits stipulated by the Directive. The research study included a field survey assessing the ELF field strengths present throughout various types of energy-related sites. A comparison with the relevant reference and action levels from the Directive 2013/35/EU was drawn to allow the assessment of any potential problem areas in the energy sector. In its conclusions, the research report provides recommendations for future work in this area. This report will be of interest to occupational health and hygiene professionals and electrical engineers.